Anchors aweigh and set sail! As an official technology provider to the famous Clipper 2017-18 Round the World Yacht Race, the Dell EMC OEM and Rugged teams along with some of our marine customers are set to join the skipper and crew for an afternoon excursion off the beautiful coast of Northern Ireland. This pleasant Derry-Londonderry boat tour will provide a tame glimpse of wild ride that’s a 40,000 nautical mile test of human courage and a tough technology ecosystem. If you’ve not already been following Dell Technologies’ timeline and exciting updates on the complete Clipper Round the World race, please find the series here. As a Clipper Race fleet partner, we have jointly provided the computing power, supporting this year’s record-breaking 40,000 nautical mile race around the world. Taking on Mother Nature’s toughest conditions along with the intrepid crew, our marine-grade products are designed to be compression-sealed from sand, dust and liquids, plus built to withstand the toughest conditions, including extreme temperature, shocks, drops, and vibrations. Our Dell Latitude Rugged extreme tablets and laptops are used by the Skipper and crew to plot the fastest routes and for general on-board navigation as well as keeping in regular contact with the Race Office. The crew post daily blogs, images, and video so family and followers at home can keep up with all the action on board. Technology aside, I think that the most amazing thing about this race is that while the yacht is manned by a professional skipper, the crew is made of ordinary people, like you and me, landlubbers with no previous sailing experience, all taking on a personal challenge that will change their lives. Having completed a rigorous training course, participants literally nail their colours to the mast and set sail on a 70-foot ocean yacht with the crew completing either the full, eleven-month circumnavigation or selecting different legs of the trip. 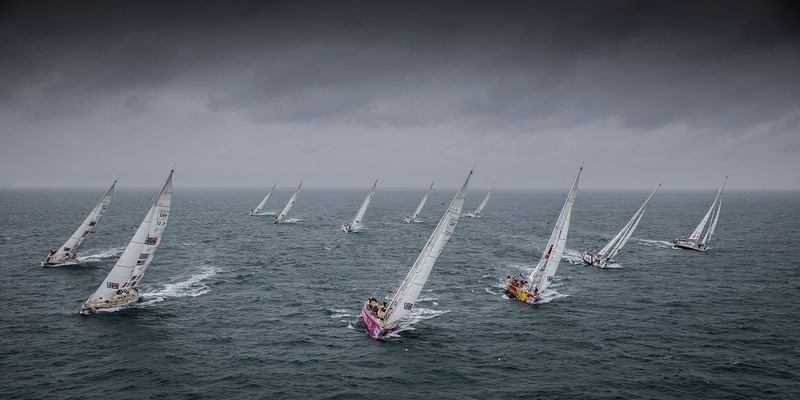 In fact, on Sunday 22 July, the teams will perform a Parade of Sail before departing Northern Ireland for the final race for this year’s edition – a 1,000nm sprint the race finish in Liverpool, England. From all accounts, this race is an incredible personal and team journey where police officers crew with chief executives, IT business executives mix with housewives, students work alongside bankers, and bartenders team up with sports commentators. In fact, some of our own Dell EMC team are part of this year’s crew – you can read their diaries here. So why are we helping to push this proverbial boat out? Simple – the marine industry is one of Dell EMC OEM’s most exciting markets as Big Data, the Industrial Internet of Things and Cloud technologies continue to propel the industry into the digital future. On our customer trip, we will share our vision of the smart ship concept, M2M learning and artificial intelligence as well as cyber resilience at sea. The team will enjoy an exclusive talk from Clipper Race Founder and Chairman, Sir Robin Knox-Johnston as well as learning about our rugged laptop and tablet technologies and how these can positively impact the marine industry. We will also share a detailed overview of our marine-grade, PowerEdge XR2 server, the bedrock of modern rugged appliance for compute on-board vessels. As part of the fun, we’ll even make some our rugged products walk the plank and endure a special, marine torture test! And as we’ll literally be in the same boat together, I believe that this is a great opportunity for customers to collaborate, share their views and influence the development of future marine-grade IT products and services. Here’s to a fair wind and following seas! Keep in touch. Follow us on Twitter https://twitter.com/etienne_mary and @DellEMCOEM, and join our LinkedIn OEM & Iot Solutions Showcase page here.